DIMENSIONS - The WHLW600S is a 6 inch wheel with 6.15 inch width with an additional 1.25 inch caliper spacing. Bearing spacing is 3.35 inches and axle spacing is 1.61 inches. The total weight of this wheel and brake assembly is under 9 pounds. The bearing axle diameter is 1.50 inches. FEATURES - The W600S is centrifugally cast utilizing 535 aluminum alloy for superior strength and corrosion resistance. This alloy provides a light weight wheel and affords many years of efficient performance. The W600S features the WHLB5 brake assembly and WHLD2 disc. The WHLB5 brake uses a 1.50 inch diameter piston in a single caliper and is commonly used for lighter aircraft with lower torque requirements (See the WHLW600XLT or WHLWI600XLT if more torque is required). 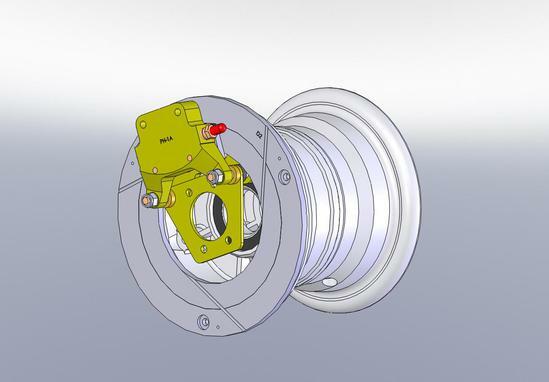 This internal caliper design is favored for use in many retractable gear systems for it's low profile compared to external caliper designs when low drag and clean lines are desired. The wheel is designed to use 6.00-6 aircraft style tires as well as any oversized tire since tire clearance is not an issue with the internal caliper design. The bearing spacing accomidates the PA-18 style axle or the MATCO mfg WHLA6 axle or WHLAXLE6 axle assembly (includes axle, nut, and washer) can be used.